My circumstances all to often shadow my peace. One kid gets in trouble at school while the other won’t admit a mistake. My husband seems overloaded with work, leaving little time for family, and friends come to me with their problems but refuse to hear solutions. 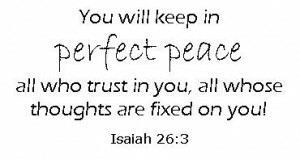 Hard to know peace, let alone “perfect peace” (Isaiah 26:3) when struggle flourishes around you. Knowing peace is not easy. Actually, I’m not sure how it’s even supposed to happen. Jesus says He gives peace not as the world gives it (John 14:27). The world’s peace depends on circumstances, which always change. Jesus’ peace depends on Him, and He’s consistent. He never changes. I know others have more serious situations than me, but comparisons don’t create peace either. They give perspective that can help tremendously, sure, but they don’t remove the existence of that which challenges my peace. The peace we so often pursue remains ever elusive under the shadow of life’s everyday struggles. Maybe we’re chasing after the wrong peace. Maybe we don’t need to chase peace at all. So what about Jesus’ peace has staying power? 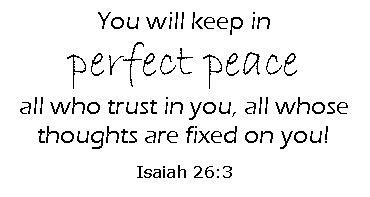 His peace is freely given and exists independent of circumstances. He doesn’t expect anything in return for the peace He gives. And because of His peace, I can choose to not allow trouble and fear to create my heart’s condition (John 14:27). Believe (John 14:1). Faith keeps trouble from taking root. Take heart (John 16:33). The world can’t beat you because it’s already been beaten. Go about your work (John 20:21). God’s sending means success is sure. Not force understanding (Philippians 4:7). His peace doesn’t make sense because we think in terms of temporal instead of eternal. Let peace rule (Colossians 3:15). In other words, focus on Him, and allow His peace to consume you. Don’t fight it. Turns out, there’s no “how to” with regard to peace. Peace just “is” because it’s a gift. When we fully focus on Christ, we have peace because our focus determines our reality. DISCUSSION: How does the peace of God exist in your life today?